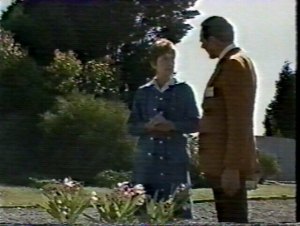 Thanks to Adrian (UK) and Sean (USA) for arranging to let me see a tape of this episode so I could transcribe the dialogue for the missing scenes. And thanks again to Tim for doing the screen captures. Bobbie returns to her cell after the aerobics class and doesn't notice that Marlene has been bashed. Marie tells Reb about the plot to replace Ann with Joan. Shane agrees with Joan that they will both give up smoking. 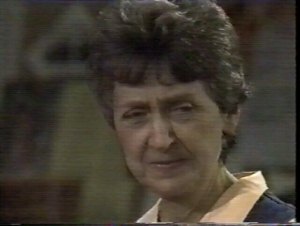 Edna tells Rachel that Harry will try to get her out. Edna: If I know my Harry, he'll move heaven and earth to get me out of here. Rachel: Guess there just aren't enough Harrys and Ricks to go round. Edna: I was terribly upset when my first husband died. Heaven knows, he'd suffered long enough, poor soul. But I learned one very important thing, Rachel. Hearts don't break. Oh, they come pretty close, alright. I know how you feel, and when you get out you'll find someone who's right for you. I just hope he'll be as wonderful as my Harry. Kay seems to be over the worst of her withdrawal symptoms. Marlene tells everyone her swollen face is due to toothache. Heather tells Dennis her brother has had an accident on his bike when a car forced him off the road, but doesn't want to report it to the police. Mrs O'Reagan is impressed with Rachel when she does kitchen duty. Mrs O'Reagan: Why can't you take a leaf out of Rachel's book? It's easy to see you know your way round a kitchen - and how to behave in it. Rachel: I was going to study home economics before I came here. Mrs O'Reagan: Just a pinch of mixed herbs, I think? Edna: Oh right, Mrs O'Reagan. Mrs O: You're new to me. What's your name again? Mrs O: Oh. [as it slowly sinks in] I've read about you: you're the poisoner! I'll not have you in here preparing food. Leave us alone immediately. Rachel: Mrs O'Reagan, that's not fair. Edna's innocent. Marlene: Yeah, her husband's even getting an appeal for her. He wouldn't do that if he thought she tried to bump him off, would he? Edna: I am innocent, Mrs O'Reagan. Mrs O: That's not what the papers said. And you are in prison, aren't you? I won't have the poisoner in my kitchen. Goodness knows, there's plenty in here don't deserve to go on breathing God's clean air, but just the same they've got their rights. And I'll not see anyone poisoned by food from my kitchen. Marlene: Tastes pretty poisonous anyway, usually. Mrs O: You watch your tongue, young lady. [To Edna] I'm going to see the Governor and have you taken off kitchen duties immediately. And don't you touch any food while I'm gone, d'you hear? [To Marlene] And I might just have a little word about you while I'm there. Now you clean up your mess. You can help her. I'll finish the rissoles myself when I get back. Heather hands over the drugs she brought in for Marie, but tells her she won't do it again: Marie tells her she ought to remember who's really got the upper hand. Edna: But how could anyone possibly poison the food in a prison kitchen? Ann: Edna, you're missing the point. Edna: I never poisoned anyone in my whole life. I obviously wouldn't have the faintest idea of how to go about it. Ann: I'm sorry Edna, but you'll just have to accept the fact that some people panic at the idea of poison. You probably think Mrs O'Reagan's irrational, but she's got a very difficult job to do here and she does it surprisingly well. We certainly don't want to lose her. Edna: But don't you see what this means? The women have been so good, they've all accepted me and the fact that I'm innocent. If I'm banned from the kitchen, they'll start to wonder. Ann: I wouldn't worry about that. The work rosters are changed every day. We'll just move you to laundry duties this afternoon. Edna: Why won't people believe me? Ann: Well, hopefully your appeal will clear up doubts once and for all. Anyway at least your husband has complete faith in you. That must be a great comfort. Edna: [nodding] Harry knows the truth and that's what really matters. 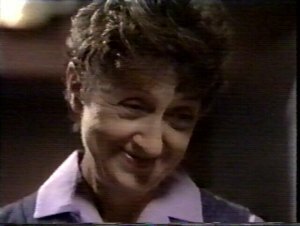 Marlene: What an old sourpuss. Fancy kicking Edna out like that. Rachel: Yeah, I can't imagine her hurting a fly let alone poisoning anyone. Marlene: We ought to teach O'Reagan a lesson. Rachel: Now, Marlene. You're in enough trouble as it is. Don't push your luck. Marlene: [winking] I've got an idea. Watch this. Euuuh! [clutching her stomach and lying flat out on the workbench] Euuuh! Mrs O: What's the matter? Is she sick? Marlene: I think I've been poisoned. Mrs O: What's she been eating? Marlene: I only had a teensy weensy little taste. Mrs O: What did I tell you? Get the nurse. No, the doctor. Get the basin quick, I don't want her being sick all over my clean kitchen. Marlene: Oh the pain, the pain. Mrs O: Somebody do something! Where does it hurt? Marlene: It hurts like hell here [pointing to her cheek] when I laugh. Marlene: Oh come on, don't do your Charlie. We're just trying to show you Edna wouldn't poison anyone. Mrs O: That's it! You've gone too far this time. Marlene: Oh where's your sense of humour, Mrs O? Mrs O: I lost it the day they started sending me lunatics like you to work in my kitchen. Well, you won't be working here again. Marlene: Oh what a shame, and I was just learning to to love peeling little spuds and gouging thier cute little eyes out. 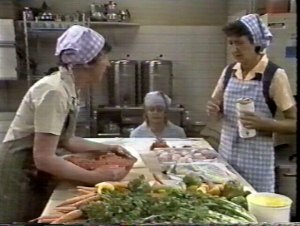 Marlene: Look, you don't report me and I won't tell everyone what you put in your rissoles. Marlene: It was only a joke. Rachel: I've got a feeling this one is going to backfire in a big way, Marlene. Judy: Why isn't Marlene serving? Edna: Got herself into strife with Mrs O'Reagan. I think she reported her to the Governor. Judy: As if she isn't in enough trouble. Did she say who bashed her? Bobbie: Two guesses: Winter or the Freak. She's been getting the heavy from both sides. Edna: She was full of beans in the kitchen in spite of her toothache. Bobbie: Yeah, and if that's a toothache, I'm a screw. Marlene: [bringing a tray to the table and sitting down] What a bummer Mrs O kicked you out of the kitchen Edna. You missed all the fun. Judy: I wouldn't worry about it too much if I were you. She's as mad as a hatter. Edna: She thinks I'm guilty. Marlene: And she reckons I'm mad. Judy: Oh well. Sometimes she's right. Bobbie: Heard from Reno yet? Marlene: Nope. I hope she doesn't put me back in the laundry. Heather goes to see Ann to offer her resignation: Ann assumes the problem is with Joan and says she should give it another couple of weeks. Myra phones Ann to tell her she isn't guilty of the crimes she's been accused of in the newspapers and is about to turn herself in: Ann hears Wally's voice in the background and realises he is helping Myra. Leigh sees her solicitor, who tells her that her lover did have the films at the time she attacked him and he thinks Roland has them now. Marlene rips up a skirt to convert it into a high fashion ensemble. Marlene: By the time I'm through with it they won't even recognise it. Bobbie: [tuning her transistor radio] Hey Edna! Edna, quick, it's your old man. Hey, turn it up Rach, quick. Harry (voice over): The whole thing is absolutely ridiculous. Now you tell me, why would a sweet lady like that try and poison me? My Edna and I have the sort of marriage you only read about in books. It's just tearing me apart to think of her shut away behind those cold grey walls for a crime she never committed. I want my Edna back and I won't rest until I get her back. Rachel: I'm surprised they didn't let you off on his testimony alone. He sounds so sincere. Bobby: Must be nice having a bloke like that looking out for you. Edna: It is, dear. It's the only thing that's kept me going these part dreadful weeks. Dear Harry. Oh, poor Harry. How he must be suffering. Meg tells Ann the building society will replace her missing money as they were at fault. Marlene: Guess what? Leigh's all for the show now. Edna: Why that's lovely, dear. Edna: Yes, I always keep it with me. Marlene: Jeez, he must be a nice bloke. You know, I reckon my dad would do exactly the same if my mum were in the same boat. If she said she didn't do it, he'd believe her. Marlene: What do you think of this then, eh? Edna: [still with her back to Marlene] Marlene, did you hear what I just said? Joan is furious with Shane for staying out all night with his friends. Roland confirms he has the films and tells Leigh he will release them at the time of her trial if she doesn't do the publicity he wants. 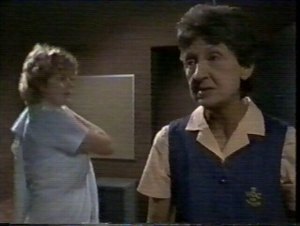 Dot is suffering from indigestion after lunch, and so is Marlene. Judy tries to help Marlene when she has to do a job for Marie. Edna is visited by Harry. Perhaps I should not be so surprised, but the information on the oleander does seem to be accurate. 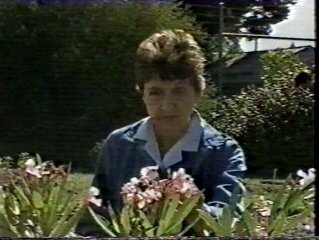 The entry in the Canadian Poisonous Plants Information System includes the following: "Oleander (Nerium oleander) is an ornamental indoor shrub found in Canadian homes and offices. This plant is quite toxic if the leaves or stems are ingested. Humans have died after eating meat that was skewered with oleander stems. Ingesting a single leaf may be toxic to a person." Edna: Oh, Harry. Sometimes I wonder if we'll ever be together again. Harry: Now you mustn't let it get you down, dear. George is very confident the appeal will be successful. You'll be home again in no time at all. Edna: I keep telling myself that but it's so hard when I can't be with the person who's been my whole world. I feel so lost somehow. Harry: Edna, I swear that when this whole horrible mess has been cleared up, I'll make sure that nothing will ever part us again. Harry: You know, you should ask if you could work out here in the garden. Much better than in that depressing old laundry. With your green fingers you could have this place looking a treat in no time. Edna: It would take a bit longer than that, I think. Harry: Oh I don't know. A bit of pruning here and there. Fixing a few things up. Like this oleander bush for instance. Could do with a bit of attention. Funny how such a dangerous plant can have such delicate flowers, isn't it? Edna: Well, it's only the sap ... (breaks off as an idea occurs to her in a burst of sinister electronic music) ... that's ... poisonous.